A new gravity-powered kinetic vendor with unbelievable action! Top-quality construction and ingenious design make it a top-notch performer. 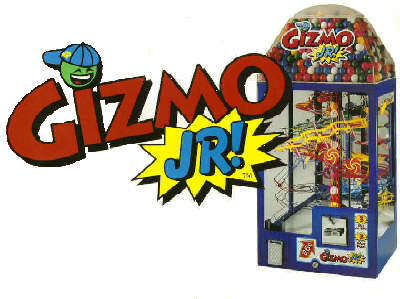 Meant for placements appropriate for the "spiral" style gumball machines, Gizmo Jr! will maximize revenue for those locations. -16" W x 13" D x 34" H.
-Approx. 45 lbs. (empty), 70 lbs. filled. Shipping weight is approx. 50 lbs. -Uses 1" diameter, 850 count gumballs, holds about 1300. -Separately lockable coin tray, holds about $400. Gizmo Jr! takes quarters, and they go in the traditional way. But when you turn the crank, gears drive a shaft which turns the vend wheel. The gumball comes out, then starts a wild roll down one of three different pathways! Our special (patent pending) triple-selector rotates once for each coin played. That ball interacts with tippers, spinners, or flippers depending on which path it takes. Then it joins a common ramp which goes to an actuator mechanism that activates a ball waiting in a different position. The new ball is the one to be vended. But it has to go through some more stuff before you get it. Meanwhile, the original ball returns to the bottom of a column of balls, where it will get fed into the group which will eventually get vended. Those gumballs are on display inside the body of the machine. But back to the new ball. After it gets released by the first ball, it rolls down a ramp, releasing its own tipping actuator, which lets another ball into the pre-release point. While that ball waits, the new ball comes down its ramp, into a trapeze-style mechanism, then down a slick spiral ramp and finally out to the chute. Whew! This thing is packed! That's what causes people to notice and try it. And then after they do, it's obvious that it's going to take more than once to even figure out how it works! Once they do, (after having spent a bunch of quarters,) they will play it again for their own amusement and for their friends. This goes for adults as well as children. People respond well to Bixworks' machines, because it's refreshing to see this kind of quality. There is a sense of value to playing a machine that is so rare these days. Owners take pride in them, and people tend to treat them well. Gizmo Jr! is colorful, completely original, and it's a huge hit. Gizmo Jr! by Bixworks Company, L.L.C.